Brand new luxury studio in a national monument, right in the historic town of Veere, with a splendid view over the harbor and the Veersemeer. You have access to a spacious private bathroom. The whole is on the second floor. The stay can accommodate up to 2 people. You can also use a sunny city garden, equipped with a round seat with parasol and sun loungers. toaster, sandwich maker, kettle, hand blender, juicer. - two single beds, electrically adjustable. - spacious bathroom with double washbasin, whirlpool, steam cabin, walk-in shower, toilet. - dining table, seating, TV, wifi. Eine schnuckelige, kleine Wohnung mit tollem Ausblick und großem Bad. 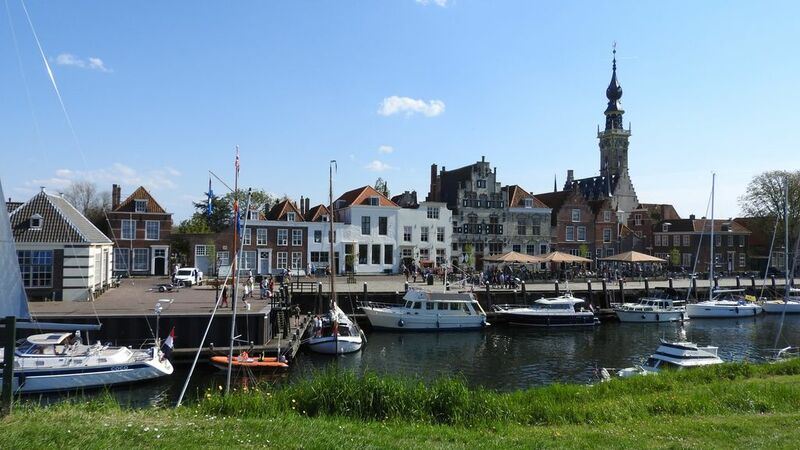 Really enjoyed our time in Veere, can’t be nearer to the center than there, studio has a fantastic Harbour view and is absolutely well equipped. Nothing you could miss. And clean anyway. Zeer nette studio die aan alle wensen voldoet! Zeer compleet ingerichte studio met een mooie badkamer die van vele luxe is voorzien. Een heerlijk dorpje om lekker te shoppen, eten of een wandeling te maken en dichtbij het stadse leven van Middelburg. Zeker een aanrader. Das Apartment ist sehr gut ausgestattet, sehr sauber und gemütlich. Der Blick auf den Hafen ist wunderschön. Die Kommunikation mit dem Vermieter hat hervorragend geklappt! Vielleicht sollte man erwähnen, dass das Apartment über zwei recht steile Treppen zu erreichen ist. We received a very friendly and most helpful welcome from Bram, our host. "Studio Hafenzicht"(Harbour View) has indeed a magnificent view. the studio has been thought out down to the last detail and is spotlessly clean. Nothing is lacking. It includes a large bathroom boasting a jacuzzi and steam shower, a fully equipped kitchen block, a very comfy new double bed. The two flights of steep stairs are a challenge not suitable for the physically impaired, but proving a good fitness exercise for us. It should be noted that food shopping is not possible in the near locality, except for a bakery close by. All in all we spent a wonderful week in Veere, topped by the the excellent recomendable accommodation . It is not the last visit! Prachtige locatie en heel hartelijk ontvangst. De locatie in het pittoreske Veere en de goed georganiseerde en heel hartelijk ontvangst waren al meer dan het halve werk. Daarnaast was alles "sauber und rein". Absoluut vatbaar voor herhaling en een aanrader voor de lezer! !.